Spend Tomorrow in Yesterday at Stoke House Bed & Breakfast and Teapots Café in Carcoar. Your new hosts Philip and Ellen Cram Welcome you to one of Carcoar’s Historic Properties, offering Accommodation and Café facilities. Attached to the rear of the main building is a modern cafe and state of the art kitchen. Dining is available within the cafe, on the verandahs or in the tranquil gardens. Has four Heritage Rooms all with ensuite bathrooms. Plans for two, two bedroom Garden Villas are in the process of being designed by our architect. Stoke House Carcoar Bed & Breakfast is located in the historic town of Carcoar NSW. Dating back to the 1820’s, Thomas Icely settled on a 68 acre block on the southern bank of the Belubula River which he called “Saltash Farm”. In 1846 a two story brick hotel, “The Victoria Hotel” was constructed. Stoke House Carcoar Bed & Breakfast contains two guest rooms, a large lounge room and a private dining room downstairs, upstairs there are two more guest rooms, a lounge room and a large balcony with magnificent views of the village. All guests rooms have ensuite bathrooms and central heating. 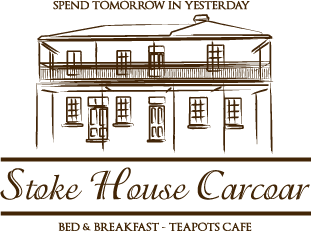 Stoke House Carcoar – Spend tomorrow in yesterday.